by Jay Pathak, Dave Runyon. Baker Books, 2012. This book is aimed at those who are unsettled by the feelings of isolation and disconnection that are too-easy to find in everyday American life, and asks the question “What is the most loving thing I can do for the people who live on my street or in my apartment building?” This starting point leads to interesting discussion, supported with a study guide, enabling congregations or small groups to expand their understanding of and response to the Great Commandment. Chapters address time, fear, and reciprocity in neighboring relationships, from an evangelical point of view. 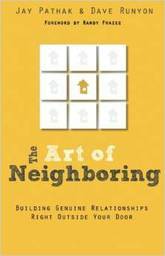 The focus on real friendships and honest relationships make this accessible for individuals who want to improve their congregation’s public ministry very locally, attuned to the biblical identify of being a good neighbor.